Since September 2015, the Indonesian government has announced the implementation of 12 economic packages with the aim of boosting the country’s economy. The packages aim to reduce bureaucratic red tape for businesses, develop Indonesia’s Small and Medium Enterprise (SME) ecosystem, as well as increase the ease of doing business in Southeast Asia’s largest market – a goal which the President himself has set out for his economic team. The most anticipated package for foreign investors was the release of the 10th economic package announced in February 2016. The package contained the much waited revision of the Negative Investment List. The Negative Investment List traditionally lists out the sectors which are closed to foreign investment or where foreign investment is capped. It was last revised in 2014, when restrictions on foreign shareholdings for industries such as cold-storage and warehousing were further tightened. In contrast, the 2016 revision of the list sees the liberalisation of the economy - with foreign ownership limitations relaxed to attract more foreign investments into key sectors of the market. The Presidential Regulation No. 44 of 2016, which contains the revised Negative Investment List, was released on 18th May 2016. This put the new rules immediately into effect. How will the revisions to the Negative Investment List affect investors? What then will this new list mean for investors? 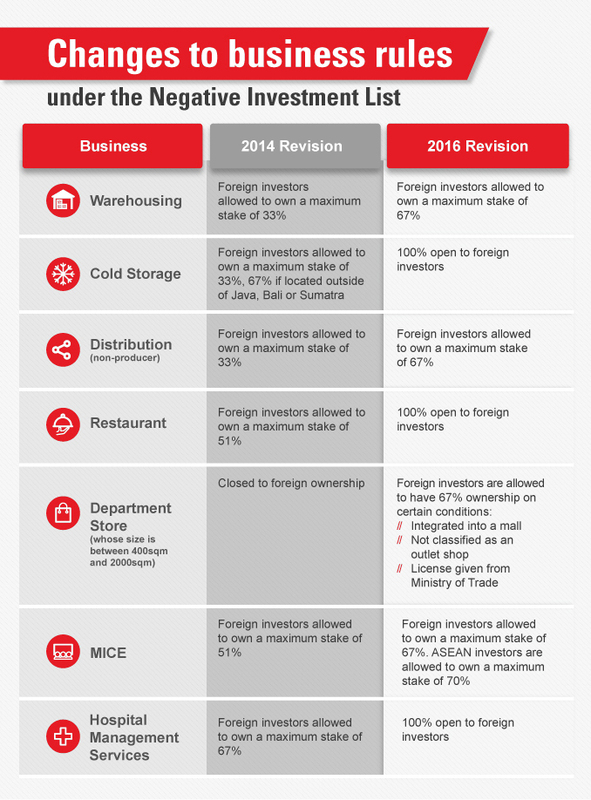 For one, the new Negative Investment List completely removes foreign ownership restrictions on several businesses in the trading, tourism, the creative economy, as well as healthcare sectors. For example, restaurants, which is classified under the sector of tourism and creative economy, can now be wholly owned by foreign investors. Previously, foreign investors could only own a maximum of 51% in a restaurant business. In order to encourage inter-ASEAN cooperation, ASEAN investors are also allowed slightly higher ownership stakes in certain sectors. This includes the MICE sector where ASEAN investors are allowed to own up to 70% of a business classified in the sector. Comparatively, non-ASEAN investors can only own a maximum of 67% in businesses classified under the MICE sector. The new list also opens sectors such as E-commerce (sales via electronic platforms) to foreign investors, subject to the investment value of the company. Foreign investors investing more than IDR 100 billion are allowed to wholly own E-commerce marketplaces or daily deals websites. However, foreign investors who invest below IDR 100 billion in the sector are required to have a local partner as they are only allowed to own maximum shares of 49%. This is the Indonesian government’s way of attracting investments to accelerate growth in E-commerce while protecting indigenous SMEs. With the liberalisation of foreign ownership across various sectors, foreign investors are now able to invest more in the country. This is an indication of the urgency of the Indonesian government to boost the Indonesian economy, which has slowed in the past 2 years. Why is Indonesia attractive to Singapore companies? Investors might then ask – Indonesia’s economic growth appeared to be facing some headwinds in the past two years, should I still be going into the market? The demographic dividend of having a population of 250 million people with a median age of 30 aside, Indonesia is an attractive investment destination for other reasons. The government has identified more than 200 infrastructure projects which are deemed to be strategic in order to accelerate implementation. The list of projects marked for acceleration include power and ports. These projects are important to the government as they would contribute to President Jokowi’s plan to increase power generating capacity by 35,000MW and improve Indonesia’s logistics costs significantly. All of these are investment opportunities for foreign investors. Although the focus of investment in recent times has been on infrastructure development, the consumer scene in Indonesia cannot be ignored. Consumers in Indonesia are increasingly becoming more affluent and well-informed (Indonesia ranks amongst the top 5 in the world for having the most number of social media users). Consumer brands will not want to miss out on the opportunity to tap one of the world’s growing consumption centres where demand should only be expected to increase. All of these being said, Singapore companies investing in the country will still need to navigate the many regulations and learn to operate in a dynamic environment. Singapore companies should be sensitive to the developments around them and be responsive to the changes that can occur at any time in the market. Leveraging on new business practices such as using social media for as a marketing tool can also help ensure that you will not miss out on opportunities. A physical set up within the market is important both visually and administratively. Indonesian businesses value their partners having a local set up as it shows the partner’s commitment towards the market. It will also address a lot of registration and tax issues. Companies bidding for government projects should also note that certain procurement rules only allow for locally based companies to bid for projects. Companies should also note that segmentation is crucial in this market. The increasing patterns of consumption and spending power of the country is not uniform across the sprawling archipelago. Something that might work in Jakarta, might not work in Medan, even though both are main consumption centres in their respective provinces or even islands. Starting a business in Indonesia does have its challenges. However, the fruits of one’s labour will be reaped when investors navigate through the intricacies of the country and embrace the operating environment of the market that is Indonesia. Click here to view our story archive.